A CONTEMPORARY VIEW OF WHITE PHOSPHORUS’ TOXIC HISTORY. This outlines a number of observations about the chemical as it stood in the early 1970’s. “Elemental white phosphorus is highly toxic to both experimental animals and man. Ingestion of even small amounts may produce severe gastrointestinal irritation,bloody diarrhea, liver damage, skin eruptions, oliguria, circulatory collapse, coma convulsions and death. The fatal dose for a man is about 1-1.4 mg/kg. No LD50 values have been determined. Chronic poisoning (from inhalation and ingestion) is characterized by such effects on the osseous system as bony necrosis (“phossy jaw”), spontaneous fractures, as well as by anemia and weight loss. White phosphorus appears to be noncarcinogenic when fed to experimental animals. Testing for mutogenicity and teratogenicity has not been carried out. Many studies of a biochemical nature have been reported and have been summarized in the report. The primary effect of phosphine is neurological and in this it differs markedly from white phosphorus. White phosphorus is also highly toxic to aquatic animals. The 96 hr LC50’s are less than 50 ppb for all fish studied, and the Incipient lethal level is probably less than 1 ppb for most fish. Crustaceans and many molluscs are more tollrant but still succumb to phosphorus concentrations of 1 ppm or less. Phosphorus poisoning appears to be cumulative and irreversible for fish and lobsters, though the cause of mortality in fish has not been determined.There is no information on the toxicity of phosphine to aquatic biota or experimental animals. This study Fosforo Blanco clinical toxicology confirms the illicit use of P4 in fireworks, which pose a great risk to children in some parts of South America. “Clinical features included: abdominal pain, cramps, diarrhoea, jaundice, nausea and vomiting, abnormal liver enzymes, and coagulation times and hypoglycaemia.” FABRICIO GONZALEZ-ANDRADE and RAMIRO LOPEZ-PULLES. This following article was written for us by a former MAFF veterinary pathologist. “White or yellow phosphorus (same phosphorus, different names) was once a common poison on account of its ready availability. It was used in Lucifer or Vesta strike-anywhere matches and was also freely available in bait for vermin. In some instances on record, snapped off match heads were enclosed in sweets to kill children. Two match heads could kill a child. Toxicity of white phosphorus increases considerably with fineness of the ingested material. Primary toxicity is due to the local irritant action on the gastrointestinal tract, which with moderate to high doses can reek of garlic. Vomit may appear luminous in the dark if studied closely. Cases are recorded where even the breath was luminous in the dark. 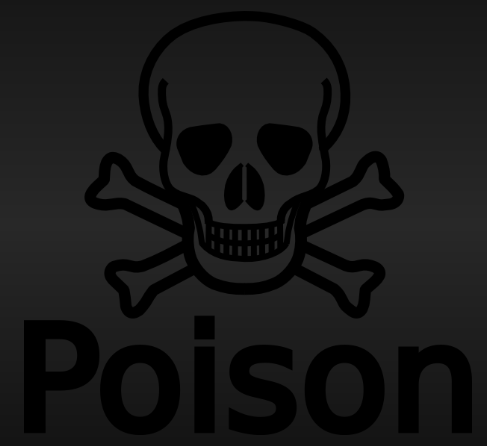 Secondary toxicity occurs several days and even up to a week later as the poison is slowly absorbed into the circulation. This causes a relapse with blood staining of vomit and diarrhoea. Jaundice is obvious with subcutaneous haemorrhages, fever and a rapid, irregular and weak pulse. Pathology : stomach mucosae (lining) is inflamed with patches of subcutaneous haemorrhage and oedema. Petechial haemorrhages are seen under the pleural and peritoneal surfaces and under the epicardium. Changes in the pathology of the liver are by far the most dramatic as the organ is grossly enlarged with severe fatty degeneration. The liver is a bright yellowy-orange in cross section feeling greasy and soft and is very easily ruptured. This pathology is responsible for the marked jaundice. The kidneys also suffer from a marked fatty degeneration. Toxicology : The average dose required to kill an adult is 60-70 mg. The smallest dose proving fatal was one of 11.6mg. These values assume an average body weight of 70kg (11 stones). There are no reported differences in the susceptibility of different species (humans, rats, mice and fowl), so assuming wild swans are similarly affected and have an average body weight of 9kg, then the calculated lethal dose would be between 2 and 8mg. Smaller amounts would be needed for younger lighter birds. Phosphorus poisoning is seldom seen these days. Throughout Victorian times right up to the 1960’s when phosphorus was still available in rat bait, it was fairly commonly seen in pathology labs and I certainly recall several cases in chickens, turkeys and dogs eating rat bait, and in feral cats eating dead poisoned rats.